To make this graph, I started with the analysis I described in ‘Some Results from Season 4’ and then pulled out single-species capture events and omitted ones without enough classifications and ones that were “hard to figure out.” Just like I did last week, I labeled each classification with the “correct” identification. Then, for each volunteer, I counted the number of classifications where the classification agreed with the correct identification. And I divided this number by the total number of classifications that volunteer did in order to calculate the volunteer’s score. The result was scores for a total of 5,004 unique volunteers plus one score for the anonymous volunteers all lumped together. To make the box plot, I used the software JMP. The boxes show the standard median and upper and lower quartiles. JMP calculates the ends of the whiskers as the upper (lower) quartiles + (-) 1.5 * interquartile range. Gray points outside below the whiskers are outliers, one point per volunteer. Especially computer-savvy readers have probably already noticed that I’ve divided up the volunteers by looking at the number of classifications by powers of two. I did this to make the numbers of volunteers in each pile more equal, as the distribution of classifications is heavily skewed toward very few. It’s essentially taking the log (base 2) of the number of classifications, just the way I did in creating the heat map last week. 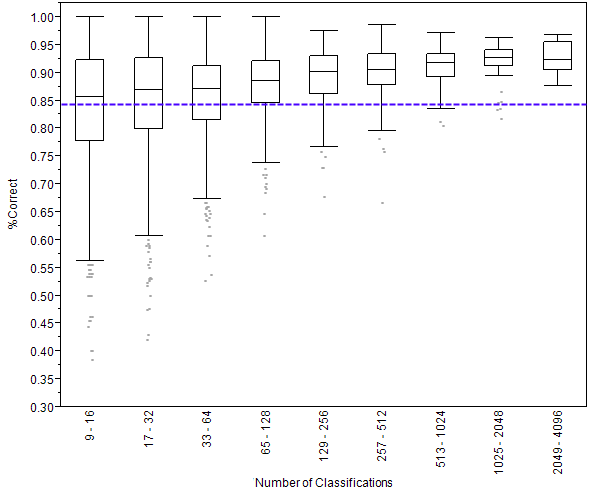 I don’t show the people who made very few classifications (8 or less) because their box plots look strange. Imagine if you’d only classified one image: then you have a score of either 100% or 0% and the median will therefore be either 0 or 1, and the box plot would be similarly skewed. I know I’ve gotten better with practice! In a dark capture, I sometimes can tell from where the eyes are lit up what type of animal it is. And most of the animals are quite familiar by now. These statistics are fascinating! Thanks Margaret! I’ve definitely improved my identification skills. My most frustrating problem is sorting out the “piles” of wildebeest. Anybody have a trick for deciding which head belongs to which spine? I miss two columns for 4097-8194 and 8195-16290 classifications. 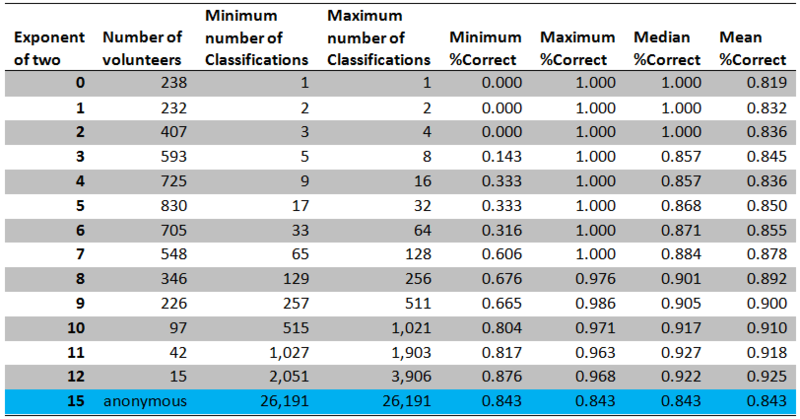 It looks as if passing the 2048 mark makes the percentage of correct classifications drop? There aren’t any columns for 4097 and higher; no one classified that many of the images analyzed here. The median score in the last column (2049-4096) is slightly lower, but the mean is actually higher. My conclusion is that there isn’t any appreciable difference between those in the 1025-2048 category and the 2049-4096 one. HI there, not sure where to write this… but just wanted to comment that I find it interesting that some types of animals seem to interact with the cameras. I’ve noticed a few times the gazelles seem quite curious. Also many shots of wildebeest gathering and resting in front of the cameras at night. Have any studies been done on this? Am I just imagining it? Hi Barbara, I’ve noticed the same thing. The gazelles sure do seem to be the most curious animals in this group. If you want to get more responses, try clicking on discuss and posting there. Enjoy!